Color, shape and texture underpin this wonderful scene of a decorative window surrounded by a colorful wall in the La Boca precinct of Buenos Aires, Argentina. Buenos Aires is a vibrant city with a rich culture and a proud history. I visited Buenos Aires after running a special photography tour to the Falkland Islands, South Georgia Island and Antarctica. The tour finished in the southern port city of Ushuaia but, as our onward flights were departing from Buenos Aires, a number of us took the opportunity to spend a few days exploring the capital city. I particularly enjoyed my time visiting and photographing the famous La Recoleta Cemetery and the tourist precinct of La Boca. However, my view of La Boca is based upon the small area I visited, one that’s been prettied up for tourists. I understand that outside of the tourist area La Boca is a poor part of town where theft and low level crime are common place. In this case I think it’s best to stick with the crowds. The architectural detail above is a favorite of mine. From my point of view it’s a formal study in composition exploring color, shape, line and texture. But it’s also a positive comment celebrating the beauty brought to this locale by the good folk who live here. I very much wanted to celebrate that fact and I hope this photo goes some way towards doing that. Apparently La Boca was settled by Italians from the city of Genoa. I’d like to think that there’s still plenty of that famous Italian passion for life residing in the streets of La Boca. Looking through the wire at colorful walls in La Boca, Buenos Aires, Argentina. As visual story tellers we photographers control the way that story is told. We create our own truth. It’s true that we deal with the information in front of our lens. However, by turning our lens in another direction, by photographing from a different perspective or through image manipulation on the computer we’re able to tell the story in a way that suits our objectives. As a case in point my decision to photograph through this wire fence suggests a feeling of dislocation. Perhaps that’s not unlike the feeling of estrangement many young folk experience in our contemporary culture. There's no doubt that the decisions we make, when constructing our images, influence the viewer's interpretation of the subjects, scenes or events depicted. 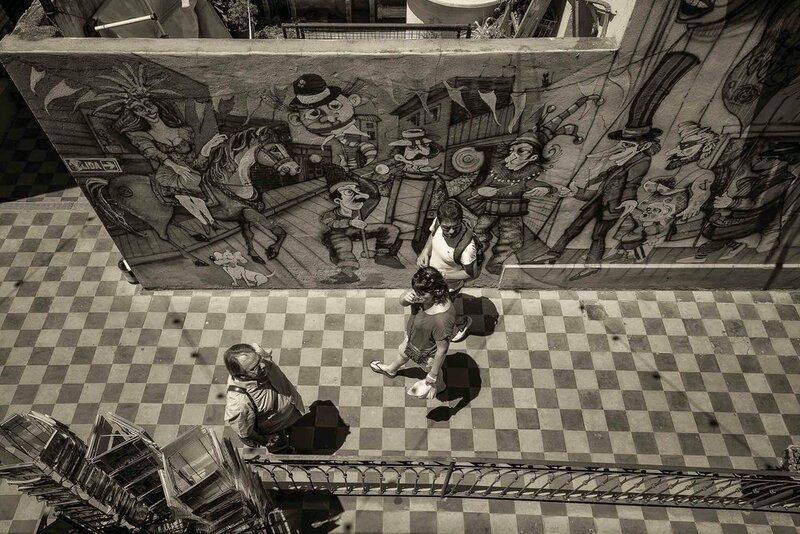 Looking down on tourists passing a wonderful mural in the La Boca precinct of Buenos Aires, Argentina. I photographed these tourists from a balcony above. The particular angle of view I employed can be referred to as a birds eye viewpoint. I remember being interested in the fantastic street art at the back of the image and wondering how the tourists passing through this space both relate to and contrast with the characters portrayed in the mural. A faded football poster on a cafe wall in the La Boca tourist precinct of Buenos Aires, Argentina. Football is such a wildly popular sport in Argentina. Some would refer to it as a religion, given the passion and open hysteria with which the most fervent supporters approach the game. I found this faded poster on the wall of a cafe in La Boca. For me it stands as a metaphor for the faded glory of Argentina, as evidenced in the dilapidated condition of many of Buenos Aires once grand buildings. But that's not to say it's not a beautiful city. It most certainly is. A detail of a statue of a mother holding a baby in the La Boca precinct of Buenos Aires, Argentina. 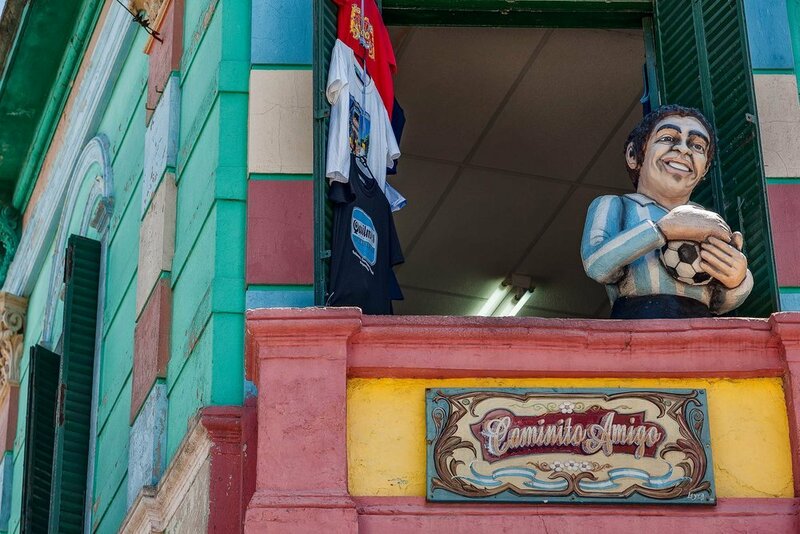 I love photographing statues and found several wonderful examples while walking the streets of La Boca. 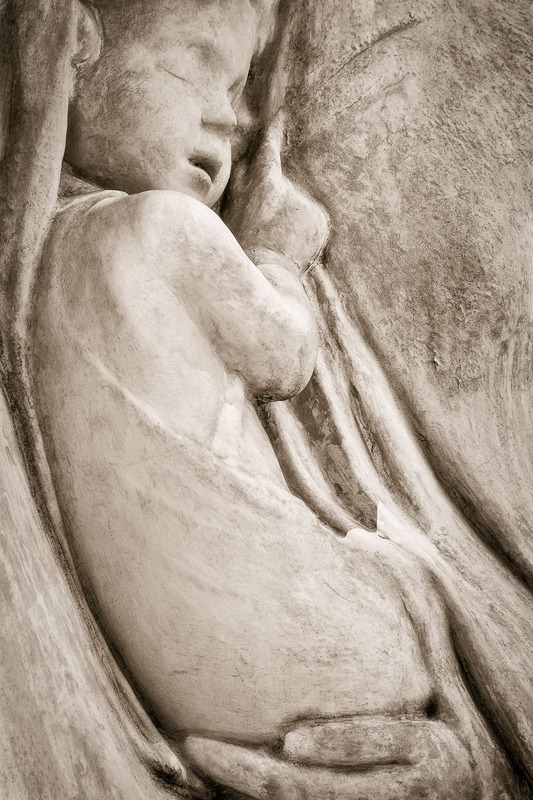 The above image is a detail of a mother cradling a baby. I believe the image refers to the Madonna and Child. I've maintained the very subtle color of the original statue, while working to enhance the fine details in the image. It may look like a black and white rendering, but it's the subtle warm color of the near whites that I find appealing. 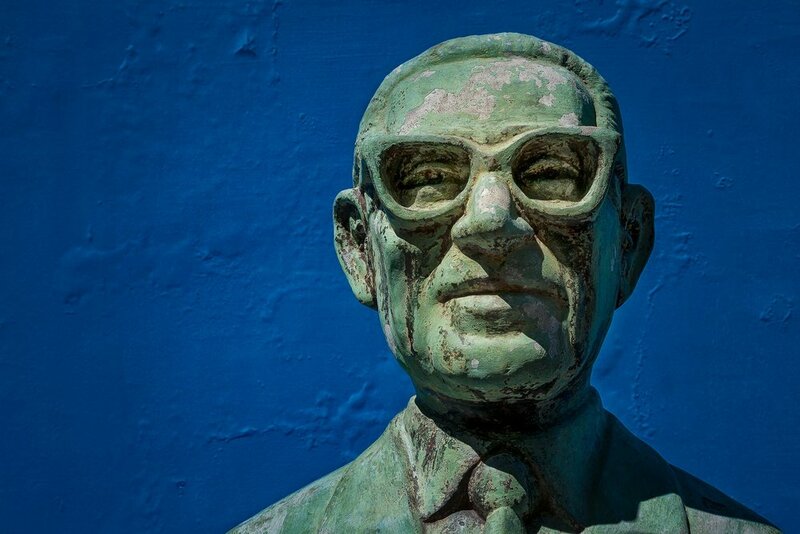 A colorful bust of a man against a blue wall at La Boca in Buenos Aires, Argentina. As a contrast the sickly green of this statue against a vibrant blue background is a radical departure from our Madonna and Child statue. I think it's fair to say that, with the exception of most portrait photography, if you're going to make color photos then color should be the dominant compositional element within those images. Color can be subtle and de-saturated (i.e., pastel), as in the above image of the Madonna and Child or, alternatively, vividly saturated as in the image of our green skin friend. But, either way, it’s important. A statue of football legend Diego Maradona on a balcony in the La Boca precinct of Buenos Aires, Argentina. I remember the genius, Diego Maradona, particularly during the Argentinian national football team's epic 1986 World Cup campaign. After initially being surprised to see the statue of Maradona, on the balcony of a tourist shop in La Boca, I just had to make this image. It's interesting that the statue of Maradona is placed where it is, one floor above street level. That means passers by have to look up to see it in much the same way we're often required to look up at monarchs, religious and political leaders. The art of manipulation lives on. A couple of performers dancing outside a restaurant in the streets of the La Boca precinct in Buenos Aires, Argentina. I made this snap of Tango dancers while waiting for a feed in a busy La Boca restaurant. My friends and I were enjoying the shade, on our outside table, provided by an umbrella. I had my camera ready to go, but the scene was very tight with folks passing in front of the camera and on either side of the dancers. I think my timing was quite good, as far as recording their expressions and body movement, but I do wish I hadn’t chopped their feet off. It looks a bit awkward. Unfortunately the Tango dancers finished not long after we arrived, but I was very impressed with their skills and really enjoyed watching their performance. I made sure I tipped them. Argentina is a very large country with spectacular and varied landscapes and a capital city with a rich and grand history. Its people are resilient and certainly possess that famous latin vest for life. As Argentina is one of the best places from which to visit Antarctica I may well return there again. If I do I’II be sure to explore more of the wonders of the country and its capital city, Buenos Aires.